Educational research is inextricably interwoven with national and global debates about and around political and economic policy. Now, to help make sense of an enormous—and growing—corpus of scholarship, and to enable users to discriminate the useful from the tendentious, superficial, and otiose, Routledge announces a new title in its Major Themes in Education series. Education Policy is a four-volume ‘mini library’ of the very best and most influential academic research concerned with the exploration, discussion, and analysis of educational policymaking, policy implementation, and policy impact. The editor of the collection has also assembled major works on theoretical debates, along with essential historical and comparative studies. Users of the collection will now be able easily and rapidly to locate key works that are otherwise often inaccessible or scattered throughout a variety of specialist journals and books. With a full index, together with a comprehensive introduction, newly written by the learned editor, which places the collected material in its historical and intellectual context, Education Policy is a crucial work of reference. It is destined to be valued by scholars, students, and researchers as a vital resource. 1. Ball, S.J. (1995) "Intellectuals or Technicians? The Urgent Role of Theory in Educational Studies", British Journal of Educational Studies, 43 (3), 225-271 (reprinted in: Hammersley, M. (2007) Educational Research and Evidence-based Practice, London, Sage, pp. 106-120. 2. Apple, Michael W. (1992) The Text and Cultural Politics Author, Educational Researcher, Vol. 21, No. 7 (Oct., 1992), pp. 4-11-19. 3. Ozga, Jenny (1987) `Studying education policy through the lives of the policy–makers: an attempt to bridge the macro–micro gap' in L.Barton and S.Walker (eds.) 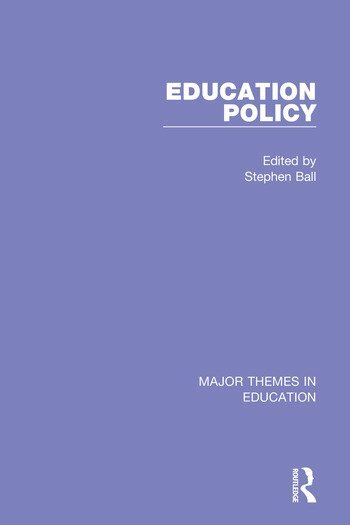 Policy, Teachers and Education, Buckingham: Open University Press. 4. Bailey, Patrick (2013) The policy dispositif: historical formation and method, Journal of Education Policy, 28:6, pp. 807-827. 5. Rizvi, F. and Bob Lingard (2006) Edward Said and the Cultural Politics of Education. Discourse: Studies in the Cultural Politics of Education, 27(3), pp. 293-308. 6. Roman, L. (2015) Making and moving publics: Stuart Hall's projects, maximal selves and education, Discourse 36 (2), pp. 200-226. 7. Keddie, Amanda (2012) Schooling and social justice through the lenses of Nancy Fraser. Critical Studies in Education, 53 3: 263-279. 8. Brown, A.L. & De Lissovoy, N. (2011). Economies of Racism: Grounding Education Policy Research in the Complex Dialectic of Race, Class, and Capital. Journal of Educational Policy. 26 (5), pp. 595-619. 9. Clarke, Matthew (2012) The (absent) politics of neo-liberal education policy, Critical Studies in Education, 53:3, pp. 297-310. 10. Daza, Stephanie (2013) Putting Spivakian Theorizing To Work: Decolonizing Neoliberal Scientism In Education, Educational Theory, 63 (6), pp. 601-620. 11. Fenwick, T. & Edwards, R. (2011). Considering materiality in educational policy: messy objects and multiple reals. Educational Theory 61 (6), pp. 709-726. 12. Gulson, Kalervo & Colin Symes (2007) Knowing one's place: space, theory, education, Critical Studies in Education, 48(1), pp. 97-110. 13. Thompson, Greg & Ian Cook (2014) Education policy-making and time, Journal of Education Policy, 29:5, pp. 700-715. 15. Hulme, Rob (2005). Policy Transfer and the Internationalisation of Social Policy. Social Policy and Society, 4, pp. 417-425. 16. Koyama, Jill & Brian Kania (2014) When Transparency Obscures: The Political Spectacle of Accountability, Journal of Critical Education Policy Studies, 12:1, pp.143-169. 17. Ladson-Billings, G. (2006) From the Achievement Gap to the Education Debt: Understanding Achievement in U.S. Schools, Educational Researcher 35(7):3-12. 18. Means, Alexander J. (2014) Beyond the poverty of national security: toward a critical human security perspective in educational policy, Journal of Education Policy, 29:6, pp. 719-741. 19. Pillow, Wanda S. (2015) Policy temporality and marked bodies: feminist praxis amongst the ruins, Critical Studies in Education, 56:1, pp. 55-70. 20. Popkewitz, Thomas & Sverker Lindblad (2000) Educational Governance and Social Inclusion and Exclusion: Some conceptual difficulties and problematics in policy and research1, Discourse: Studies in the Cultural Politics of Education, 21:1, pp. 5-44. 21. Peters, Michael A. (2009) Education, creativity and the economy of passions: new forms of educational capitalism, Thesis Eleven February, 96:1, pp. 40-63. 22. Tannock, S. (2010) Learning to plunder: global education, global inequality and the global city. Policy Futures in Education 8(1), pp. 82-98. 23. Mundy, Karen and Antoni Verger (2015) The World Bank and the global governance of education in a changing world order, International Journal of Educational Development, 40, pp. 9-18. 24. Ramia, Gaby, Simon Marginson, Erlenawati Sawir, Chris Nyland (2011) International business and cross-border education: a case of the Janus face of globalisation? Global Business and Economics Review, 13(2), pp.105 – 125. 25. Polelo, Mompati Mino (2009) The Small State, Markets and Tertiary Education Reform in a Globalised Knowledge Economy: Decoding Policy Texts in Botswana’s Tertiary Education Reform, Journal of Critical Education Policy Studies, 7(1), pp. 407-432. 26. Olssen, Mark (2006) Understanding the mechanisms of neoliberal control: lifelong learning, flexibility and knowledge capitalism, International Journal of Lifelong Education, 25:3, pp. 213-230. 27. Lubienski, Christopher (2013) Privatising form or function? Equity, outcomes and influence in American Charter Schools, Oxford Review of Education, 39:4, pp. 498-513. 29. Saltman, K. (2014) The Austerity School: Grit, Character and the Privatization of Public Education, Symploke 22 (1-2), pp. 41-57. 30. Atasay, Enging & Garrett Delavan (2012) Monumentalizing disaster and wreakconstruction: a case study of Haiti to rethink the privatization of public education, Journal of Education Policy, 27:4, pp. 529-553. 31. Bhanji, Z. (2012) Transnational Private Authority in Education Policy in Jordon and Soth africa: The Case of Microsoft Corporation, Comparative Education Review 56 (4), pp. 300-319. 32. Brown, Phillip, Lauder, Hugh and Ashton, David (2008) Education, globalisation and the future of the knowledge economy. European Educational Research Journal 7 (2), pp. 131-156. 33. Dale, I. R. & Robertson, S. L. (2002) The varying effects of regional organizations as subjects of globalization of education,　Comparative Education Review. 46 (1), pp. 10-36. 34. Grimaldi, Emiliano & Roberto Serpieri (2013) Privatising education policy-making in Italy: New governance and the reculturing of a welfarist education state, Education Inquiry, 4(3), pp. 443- 472. 35. Gopinathan, S. (2005) Globalisation, the Singapore developmental state and education policy: a thesis revisited, Globalisation, Societies and Education 5 (1), pp. 53-70. 36. Gorur, R. (2011) Policy as Assemblage, European Educational Research Journal December 2011 10(4), pp. 611-622. 37. Torres, Carlos Alberto (2002) Globalization, Education, and Citizenship: Solidarity Versus Markets? American Educational Research Journal 39( 2), pp. 363–378. 38. Verger, Antoni (2012) Framing and selling global education policy: the promotion of public–private partnerships for education in low-income contexts, Journal of Education Policy, 27(1), pp. 109-130. 39. Apple, Michael W. (2006) Education and Godly Technology, Gender, Culture, and the Work of Home Schooling, Social Analysis: The International Journal of Social and Cultural Practice 50(3), pp. 19-37. 40. de Lissovoy, Noah (2010) Rethinking Education and　Emancipation: Being, Teaching, and Power,　Harvard Educational Review, 80:2, pp. 203-220. 41. Gale, Trevor (2003) Realising Policy: The who and how of policy production, Discourse: Studies in the Cultural Politics of Education, 24(1), pp. 51-65. 42. Grek, S and Ozga, J. (2010) Re-Inventing Public Education The New Role of Knowledge in Education Policy Making, Public Policy and Administration July, 25(3), pp. 271-288. 43. Steiner-Khamsi, Gita (2006). The economics of policy borrowing and lending: a study of late adopters. Oxford Review of Education, 32/5, pp. 665-678 – E.
44. Thomson, Pat, (2014) 'Scaling up' educational change: Some musings on misrecognition and doxic challenges, Critical Studies in Education. 55(2), pp. 87-103. 45. Thrupp, Martin (2013) Researching amid the Heat and Noise of Political Debate, Policy Futures in Education, 11(6), pp. 722-732. 46. Alegre, Miquel Àngel, Jordi Collet,and Sheila González (2011) How Policies of Priority Education Shape Educational Needs: New Fabrications and Contradictions, Educational Policy, 25:2, pp. 299–337. 47. Au, Wayne and Joseph Ferrare (2014) Sponsors of Policy: A Network Analysis of Wealthy Elites, Their Affiliated Philanthropies, and Charter School Reform in Washington State, Teachers College Record 116, pp. 1-24. 48. Ball and Junemann (2011) Education Policy and Philanthropy – the changing landscape of English educational governance, International Journal of Public Administration, 34(10), pp. 646- 661. 49. Beech, Jason (2009) Policy spaces, mobile discourses, and the definition of educated identities, Comparative Education, 45(3), pp. 347-364. 50. Bradbury, A., McGimpsey, I. and Santori, D. (2012) Revising Rationality: the use of ‘Nudge’ approaches in neoliberal education policy, Journal of Education Policy, 28(2), pp. 247-267. 51. Evans, John, Emma Richa, Rachel Allwooda and Brian Daviesb (2008) Body pedagogies, P/policy, health and gender, British Educational Research Journal Vol. 34, No. 3, June 2008, pp. 387–402. 52. Johannesson, ingolfur Asgeir, Sverker Lindblad, Hannu Simola (2002) An Inevitable Progress? Educational restructuring in Finland, Iceland and Sweden at the turn of the millennium, Scandinavian Journal of Educational Research, 46(3), 325-339. 53. Liasidou, Anastasia (2011) Unequal Power Relations and Inclusive Education Policy Making: A Discursive Analytic Approach, Educational Policy, 25(6), pp. 887–907. 54. Lingard, Bob and S. Rawolle (2004) Mediatizing educational policy: the journalistic field, science policy, and cross‐field effects, Journal of Education Policy, 19:3, pp. 361-380. 55. Lipman, Pauline (2003) Chicago School Policy: regulating Black and Latino youth in the global city, Race Ethnicity and Education, 6:4, pp. 331-355. 56. Marshall, K. and Michelle Young (2013) "Policy Inroads Under-Mining Women in Education," International Journal of Leadership in Education. 16(2), pp. 205-219. "Civil society actors and the state in the achievement of Education for All – Lessons from Kenya, Tanzania, Mali and Burkina Faso." Development In Practice. 20(4-5), pp. 58. Olmedo, Antonio (2014) From England with love… ARK, heterarchies and global ‘philanthropic governance’ Journal of Education Policy, 29(5), pp. 575-597. 59. Reckhow, Sarah and Jeffrey W. Snyder (2014) The Expanding Role of Philanthropy in Education Politics, Educational Researcher published online 8 May 2014. 60. Sellar, Sam and Bob Lingard (2014) The OECD and the expansion of PISA: new global modes of governance in education, British Educational Research Journal, 40(6), pp. 917-936. 61. Spillane, J. P. (2012). Data in practice: Conceptualizing the data-based decision-making phenomena. American Journal of Education, 118(2), pp. 113-141. 62. Weis, Lois, Yoshiko Nozaki, Robert Granfield and Nils Olsen (2007) A Call for Civically Engaged Educational Policy-Related Scholarship, Educational Policy, 21(2), pp. 426-433. 63. Masschelein, Jan and Simons, Maarten (2002) An adequate education in a globalized world? A note on immunization against being-together. Journal of Philosophy of Education 36(4) pp. 589-608. 64. Maguire, M, Hoskins, K, Ball, S & Braun, A (2011), 'Policy discourses in school texts'　Discourse (Abingdon): studies in the cultural politics of education, 32(4), pp. 597 - 609. 65. Koyama, Jill P. In Press. Resettling Notions of Social Mobility: Situating Refugees as "Educable" and "Employable". British Journal of Sociology of Education 34(5/6), pp. 947-965. 66. Gillborn, D. (2010) Reform, racism and the centrality of whiteness: assessment, ability and the ‘new eugenics’,　Irish Educational Studies, 29(3), pp. 231- 252. 67. Baker, B. (2002) The Hunt for disability: The new eugenics and the normalization of school children, Teachers College Record, 104(4), pp. 663-703. 68. Carter, Bob and Stevenson, Howard (2012) Teachers, workforce remodelling and the challenge to labour process analysis, Work, Employment and Society 26(3) pp. 481-496. 69. Connell, Raewyn (2009) Good teachers on dangerous ground: towards a new view of teacher quality and professionalism, Critical Studies in Education, 50(3), pp. 213-229. 70. Decuypere, Mathias, Carlijne Ceulemans & Maarten Simons (2014) Schools in the making: mapping digital spaces of evidence, Journal of Education Policy, 29(5), pp. 617-639. 71. Black, Rosalyn (2015) Between policy and a hard pedagogical place: the emotional geographies of teaching for citizenship in low socio-economic schools, Pedagogy, Culture & Society, 1-20. 72. Slee, Roger (2013) How do we make inclusive education happen when exclusion is a political predisposition? International Journal of Inclusive Education, 17(8), pp. 895–907. 73. Unterhalter, Elaine (2009) Translations and transversal dialogues: an examination of mobilities associated with gender, education and global poverty reduction, Comparative Education, 45(3), pp. 329-345. 74. Vincent, C.,　Braun, A. &　Ball, S. (2010) Between the estate and the state: struggling to be a 'good' mother, British Journal of Sociology of Education. 31(2), pp. 123-138 16. 75. Gibton, D (2002) Men & Women for All Seasons: The implications of educational leadership theory and research. Management in Education, 17(1), pp. 9-13. 76. Gunter, Helen M. (2013) "Distributed Leadership: a study in knowledge production." Educational Management, Administration & Leadership 41(5), pp. 556-581. 77. Ness, Erik C. and Denisa Gándara (2014) Ideological Think Tanks in the States: An Inventory of Their Prevalence, Networks, and Higher Education Policy Activity, Educational Policy, 28(2), pp. 258–280. 78. Penney, Dawn (2013) From policy to pedagogy: prudence and precariousness; actors and artefacts, Asia-Pacific Journal of Health, Sport and Physical Education 07/2013 4(2), pp.189-197. 79. Savage, G. (2012) Being different and the same? The paradoxes of ‘tailoring’ in education quasi – markets, Journal of Pedagogy, 3 (2), pp. 279 – 302. 80. Simons, Maarten, Lisbeth Lundahl and Robeto Serpieri (2013) The Governing of Education in Europe: commercial actors, partnerships and strategies, European Educational Research Journal, 12(4), pp. 416-424. 81. Smyth, John (2010) Speaking back to educational policy: why social inclusion will not work for disadvantaged Australian schools, Critical Studies in Education, 51(2), pp.113-128.